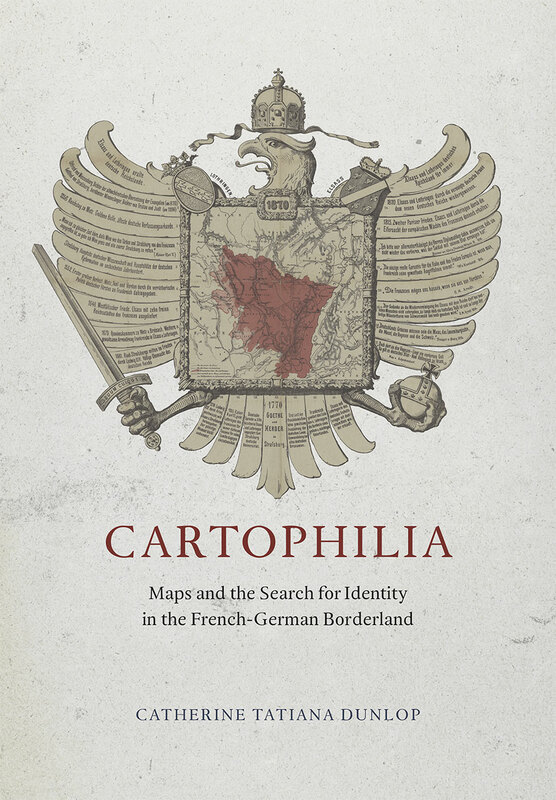 Cartophilia: Maps and the Search for Identity in the French-German Borderland. Chicago: University of Chicago Press, 2015. 257 p., 16 colored plates. $45.00. Catherine T. Dunlop teaches modern European history at Montana State University. 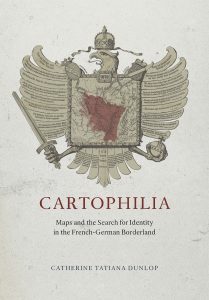 Cartophilia, her first book, has justifiably received high praise from other scholars. This book is a stunning, interdisciplinary examination of how the strategically and historically significant Alsace-Lorraine region between the Vosges Mountains and the Rhine River has been mapped since the middle of the 17th century to the close of World War II. Perhaps even more significant is Dunlop’s groundbreaking application of various scholarly methods—cartographic, historical, social, and bibliographic among them—to reveal bracing new approaches to the critical study of maps and mapmaking and their cultural importance. Dunlop systematically approaches her subject by first focusing on official, state-created maps of Alsace-Lorraine. Beginning with an illuminating discussion of how maps created under the formal auspices of political sponsorship emerged from early surveying practices in the 17th century, Dunlop establishes the tension between competing French and German historical interests, such as governance, economics, and natural resources, which provides the critical thrust of her study. From the history of official, often military-based mapping of this valuable, contested territory, Dunlop shows how amateur 19th century cartographers from emerging social science fields such as anthropology and history sought to map the boundaries of Alsace-Lorraine according to thematic and idealized views of the border between France and Germany. Their cartographic efforts attempted to show how contested spaces could be mapped according to cultural biases reinforced by social scientific approaches to the study of Alsace-Lorraine landscapes and communities. Dunlop closes the first section of her book with a chapter devoted to perhaps the most rigorous application of these ideas—the language map. The second half of Dunlop’s study shifts focus from macro-level cartography of the Alsace-Lorraine region to the more intimate scope of mapping the idea of home in Alsace-Lorraine, hiking maps, and historical visualizations of Strasbourg, the historical capital of the region and the current seat of the European Parliament. In these chapters, Dunlop brilliantly underscores the idea laid out in earlier chapters that the very act of mapmaking is a complex attempt to articulate the nuances of identity on countless levels, including public and private, national and regional, cultural and political. Dunlop’s critical readings of cartographic documents are revelatory and demonstrate innovative ways to apply the study of maps to enhance research in seemingly any discipline. Cartophilia breaks new ground in the ways we can use maps to better understand ourselves. Dunlop is a very gifted writer who articulates difficult ideas with clarity and energy. Her book, which significantly expands on research she conducted for her doctoral dissertation, is helpfully and richly illustrated with images of the maps she uses to support her arguments. In addition to being a handsome scholarly monograph, Dunlop’s superb notes, bibliography, and index make Cartophilia immanently usable as the rarest kind of scholarly work—the kind readers will reread for pleasure as well as edification.